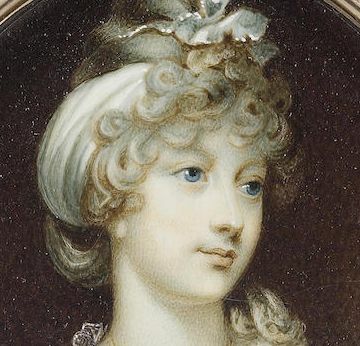 This beautiful and historically significant portrait depicts Princess Amelia, the youngest daughter and reputedly the favourite child of King George III. Seated before a red drape, she is wearing a bluish-white dress with short sleeves with a gold armlet, a drawstring neckline and a bright blue sash tied at the waist together with a white kerchief wound round her powdered curls. 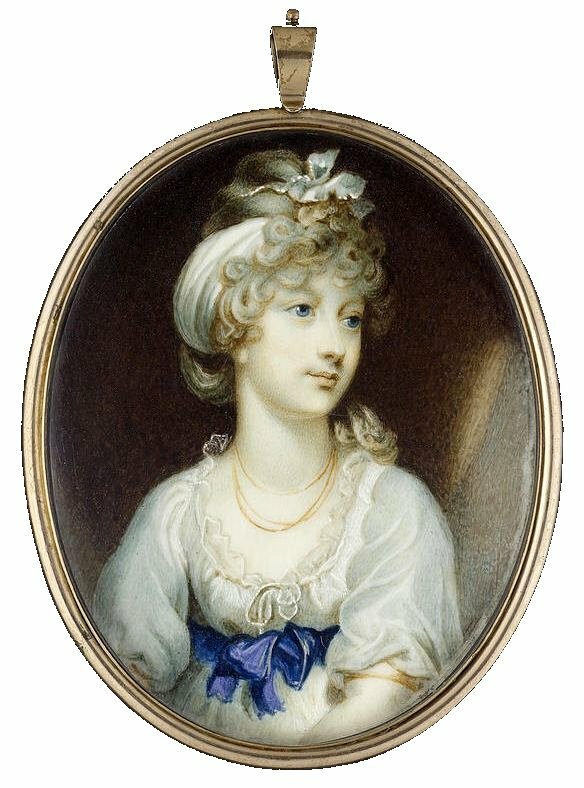 This miniature is attributed to Lady Beechey and is a copy of an oil portrait that was exhibited at the Royal Academy in 1797 that was painted by her husband, Sir William Beechey, for the then Prince of Wales. There is an identical example of this miniature in the Royal Collection and the Princess is known to have also gifted one to Admiral Sir Harry Neale, captain of the Royal Yacht. The miniature is housed in the original plain gold frame. There is a small are of rubbing to the extreme right hand edge (visible in the image) but otherwise both the painting and the frame are in excellent condition. The youngest of fifteen children, Princess Amelia (1783-1810) was born at Windsor Castle and had rather an isolated upbringing. Her father suffered his first bout of madness when she was just five years old. Amelia herself was not robust and fell ill with tuberculosis as a teenager. This was in later years compounded by measles and then erysipelas, a skin infection, and she died prematurely in 1810 at the age of twenty-seven much to the distress of her family and especially of her father whose health collapsed soon afterwards. The identity of the artist is unknown but royal sources suggest that it may have been painted by Lady Anne Beechey née Jessop (1764-1833/4). 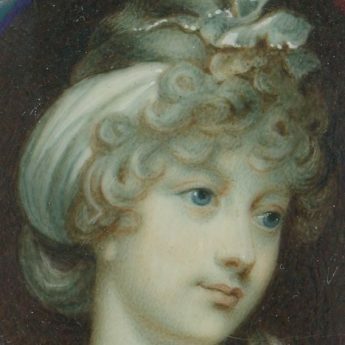 She was Sir William Beechey’s second wife and went on to have sixteen children by him, including a set of twins, over a twenty-eight year period, the youngest being born when she was almost sixty years old. 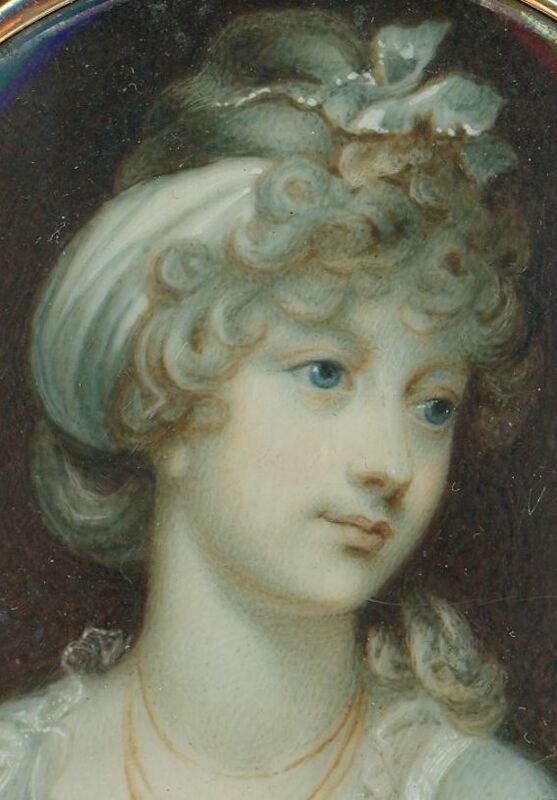 She exhibited at the Royal Academy between 1795 and 1805.